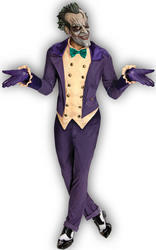 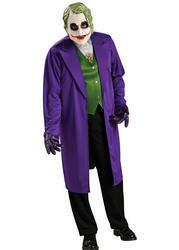 The Dark Knight returns in this fabulous Men's deluxe Batman fancy dress costume, perfect for any fancy dress party or just for taking on the Joker. 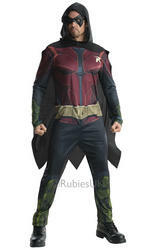 This is one of the most premium Batman fancy dress costumes available and its high attention to detail proves exactly that. 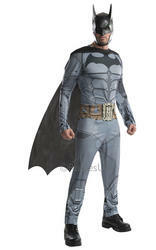 The officially licensed outfit contains everything for transforming yourself into the caped crusader and comprises of a Batman jumpsuit complete with attached boot toppers and muscle chest bearing the iconic batman logo so you really look like Bruce Wayne, Batman mask headpiece, flowing cape and Batman's iconic utility belt with debossed Batman Bat logo to the buckle. 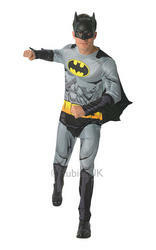 You'll be roaming through Gotham City in style with this Batman fancy dress costume.